– the best ideas come from building on the ideas and inventions of others. From the Renaissance to satellites, medical breakthroughs to social media, Charles Darwin to Marconi, Steven Johnson shows how patterns of creativity occur. 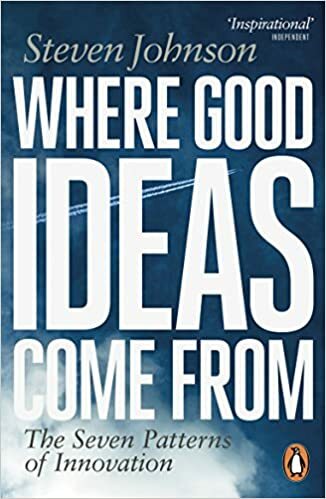 Johnson counters the colloquial description of good ideas as sparks, flashes or eureka moments and likens them to networks. For new ideas the sheer size of network is needed and it needs to be plastic – capable of reconfiguration. Innovation thrives on a wide pool of minds. The eureka moment is usually preceded by the slow hunch like Darwin’s theory of evolution that developed over many years. Johnson extols the power of accidental connections or serendipity in the recognition of the significance of the new ideas. Innovation prospers when ideas can be serendiptiously connected and recombined with other ideas, when hunches can stumble across other hunches. Walls dividing ideas such as patents, trade secrets and proprietary technology inhibit serendipidy. Open environments are more conducive to innovation than closed. Error which creates a path that leads you out of your comfort zone and exaptation , which are traits optimised for a specific use getting hijacked for a completely different use (birds feathers evolved for warmth proving useful for flying) are key paths to innovation. The history of the world wide web designed for the academic environment now used for shopping, sharing photos and Google. Johnson classifies sources of key innovations from 1400 to the present day according to whether they were driven by the individual or a network and whether they were market driven or non market. He concludes that non market, open platform networked approach is now far more prolific. Witness Google, Twitter, Amazon. Borrow it from a public library, look for it in a charity shop, go to this bookshop down your high street and enjoy the stroll in the sunshine, or maybe find it online and you know how it goes.